Reduce Energy Consumed By PC Peripherals in Standby. 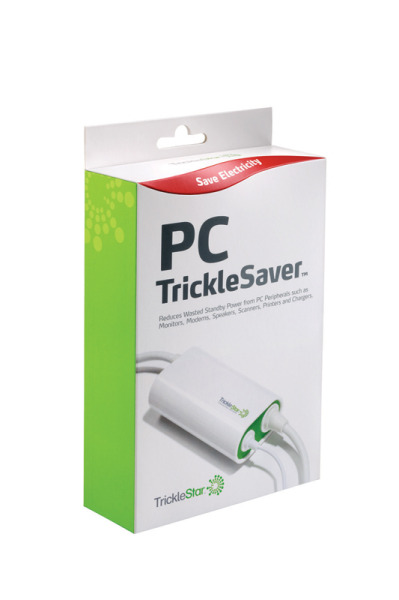 The TrickleStar™ PC TrickleSaver™ reduces the standby energy consumed by PC Peripheral equipment and thereby reduce your energy bil. This innovative product connects to a PC via a standard USB connector and detects the power status of a PC via the USB port. When a PC is powered, the product will switch On all peripheral devices. Conversely when a PC is switched Off, the product will switch Off all peripheral devices. Saving energy costs is a simple as that! Save Power today. The PC TrickleSaver requires the PC to switched off completely. The PC TrickleSaver will not work when a PC is placed into a sleep / hibernation state. If you require peripheral devices to switch off in a sleep / hibernation state, a TV TrickleSaver should be used. Certain manufacturers of products containing hard disk drives do not recommend hard switching off of their products. We recommend reviewing the manufacturers documentation prior to use of a PC TrickleSaver with these products.